Pan fried scallops, textures of apple. baked golden cross goats cheese,fig, fruit bread wafer. I asked Alec to cook a special meal for Mothers Day this year - We chose the 7 course tasting menu. Alec was a sheer delight, punctual, tidy, friendly, he took care of everything and every single course of the meal was amazing, we especially loved the hoi sin pork, the Coq au Vin and the liquid chocolate cake. I would not hesitate to recommend Alec to others seeking the very best food in the comfort of their own home. Our whole experience was excellent. Alec was attentive right from the very moment we booked, with some good advice on menu selection. He kept in touch right throughout and was very pleasant to deal with. The food on the evening was fantastic and Alec provided a few appetizers, palette cleansers and nibbles in addition to the 3 courses ordered. Needless to say, the food on the evening was fantastically cooked and the whole experience was brilliant. What an experience! Alec cooked an amazing meal for my wife and I for her 40th birthday. 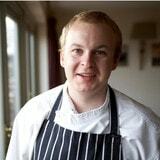 The food was exceptional, Alec was friendly, chatty, entertaining and an absolute pleasure to have as a guest. He made it a birthday to remember and I would recommend him without hesitation! If you believe this content violates or infringes your rights, Alec Maxfield may not know. You could solve this problem by contacting him.